Traditional farming is taking a huge toll on the environment—a problem that’s set to worsen due to our ever-growing global population. Yet there are some high-tech solutions. Here’s what you need to know about the burgeoning practice of controlled-environment agriculture and how it’s set to change everything from the foods we eat to the communities we live in. As a practice, traditional farming is not going to disappear any time soon. It’ll be quite some time—if ever—before other methods completely supplant it. But it’s crucial that alternatives be devised to alleviate the pressure imposed by conventional farming methods. Negative environmental effects of traditional farming include the steady decline of soil productivity, over-consumption of water (including water pollution via sediments, salts, pesticides, manures, and fertilizers), the rise of pesticide-resistant insects, dramatic loss of wetlands and wildlife habitat, reduced genetic diversity in most crops, destruction of tropical forests and other native vegetation, and elevated levels of carbon dioxide and other greenhouse gases. And as urban sprawl continues unabated, vast swaths of productive farmland are being eliminated. Estimates place the amount of farmland lost to development since 1970 at a whopping 30 million acres. As a solution, an increasing number of horticulturalists and entrepreneurs are turning to controlled-environment agriculture (CEA), and the related practice of vertical farming. While not a total panacea, these high-tech farms are doing much to address many of the problems associated with conventional farming practices. One company that’s leveraging the power of CEA is IGES Canada Ltd. Headed by President and Executive Director Michel Alarcon, IGES is working to own and operate a number of CEA facilities in both populated and remote communities. The company’s overriding mandate is to rebuild resilient communities and dramatically reduce CO2 emissions. As Alarcon explained to io9, environmentally-controlled farms like the one implemented by IGES have a number of inherent advantages. Compared to conventional farms (and depending on the exact configuration and technologies used), they’re around 100 times more efficient in terms of their usage of space, 70-90% less reliant on water, with a lower CO2 footprint. Foods are grown without the use of pesticides, they’re nutrient-rich, and free from chemical contaminants. And because they can be built virtually anywhere, CEAs can serve communities where certain foods aren’t normally grown. Alarcon plans to introduce his company’s technology to northern regions of Canada, where they would serve aboriginal populations. Conceivably, such facilities could be installed in any number of extreme environments, including the desert or in regions stricken by drought. These facilities, which are used by IGES to produce broad leaf products like micro-greens, herbs, and soft fruit, can produce 912 metric tons per year in a 10,000 square meter space. And that’s via horizontal farming, IGES’s preferred method of CEA. With increased roll-out of these facilities, the company can supplant foreign food imports during winter months. “The savings from a reduction in transportation costs will enable the price of our food to be less than organic food prices,” says Alceron. Operations like the ones visualized by IGES Canada likely will have a profound impact on local communities. CEAs will make certain foods available year-round, providing a variety of healthy food sources, while creating local employment and promoting cultural preservation. IGES Canada will soon be initiating a crowd financing campaign, while expanding its equity financing partner base. Startup costs for ventures like these can be intense. A few years ago in Vancouver, a company sought to install a massive greenhouse for vertical lettuce production on top of a city-owned parking structure, but failed. Some of it had to do with investors and contracts with the city, but it was also hampered by high startup costs relative to the resulting crop yields. As Foodshare Senior Coordinator Katie German explained to io9, many of the farms are also set up to grow food for restaurants—growing for high price points—and are not necessarily concerned about making food more accessible (which the high startup costs requires). Currently, the Vancouver company is trying to sell their failed $1.5 million greenhouse on craigslist. Other successful examples include plant factories set up by the Mirai Group, and the Zero Carbon Food’s operation in which a WWII bomb shelter was converted into a high-tech underground farm. “The whole system runs automatically, with an environmental computer controlling the lighting, temperature, nutrients and air flow,” noted Steven Dring, co-founder of the company, in a Bloomberg article. Environmentally-controlled farming is more than just a glorified form of hydroponics. These facilities employ a number of sophisticated techniques and technologies to produce nutritious and tasty foods at reasonably high yields. One critical component of the IGES model is the use of polarized water, which enables water to hold on to a greater amount of nutrients. “The injection of energy in water modifies the bond angle of hydrogen and oxygen atoms and makes the molecular structure more attractive to nutrients, and therefore carry a higher amount of these nutrient to root and plant leaf surface and increasing growth rate,” explained Alarcon. This process also increases redox effect (oxidation) and elimination of bacterial and microbial pathogens. Carbon dioxide (CO2) is an essential component of photosynthesis, a process also called carbon assimilation. Photosynthesis is a chemical process that uses light energy to convert CO2 and water into sugars in green plants. These sugars are then used for growth within the plant, through respiration. The difference between the rate of photosynthesis and the rate of respiration is the basis for dry-matter accumulation, i.e. growth, in the plant. For the majority of greenhouse crops, net photosynthesis increases as CO2 levels increase from 340–1,000 ppm (parts per million). According to Alarcon, most crops show that for any given level of photosynthetically active radiation (PAR), increasing the CO2 level to 1,000 ppm will increase the photosynthesis by about 50% over ambient CO2 levels. Ambient CO2 level in outside air is about 340 ppm by volume. All plants grow well at this level, but as CO2 levels are raised by 1,000 ppm, photosynthesis increases proportionately, resulting in more sugars and carbohydrates available for plant growth. And CEAs provide an excellent venue for our excess CO2. These bioreactors employ a light source and photosynthesis to cultivate phototrophic microorganisms (those that use energy from light to fuel metabolism), including plants, mosses, microalgae, cyanobacteria, and purple bacteria. It typically allows for much higher growth rates and purity levels than in natural habitats. Photobioreactors transform CO2 into highly nutritious plant food which is readily absorbed by plants. The internal environment of CEAs must be carefully maintained, including steady temperature, humidity, and isolation from external air. Climate control minimizes plant environmental stress and exposure to harmful pests. Similarly, optimal multi-spectrum lighting and light exposure can be applied year-round, regardless of season and natural light availability. Recently, LED grow lights have evolved to offer multi spectrum lighting range, thus enabling a broader range of plant varieties to thrive in this environment. These facilities are also highly scalable. IGES Canada’s operations are scalable from a 1/4 acre (250m2) operation to multiples of 3 acres (10,000m2) facilities. According to Timothy Hughes, an organic horticulture specialist working in Toronto, the potential social benefits to enviro-controlled farming are enormous. At the same time, however, Hughes says that environmentally-controlled farming may be technologically flashy, but it’s not as efficient as it’s being touted. He points to high building maintenance and energy costs, along with ongoing technological investments. Hughes would rather see the money spent on labour and horticultural infrastructure innovations than on enormously expensive megastructures. He points to permaculture as a possible alternative—aquaponics in particular. Aquaponics is a system of symbiotically growing hydroponic vegetables and fish. This delivers two high-value crops while sharing resources, reducing or totally eliminating waste, and increasing energy efficiency during production. Currently, aquaponics is in use, but not widely. Hughes envisions growing this to a larger scale, in more urban spaces, with a greater and denser mass of growing space. And then there’s the issue of soil—or lack thereof. According to Katie German, there has been some pushback from organic farmers about not having any soil, and farming is fundamentally about soil and biology. “If you don’t have soil fertility you might be going with synthetic fertility—which has a whole myriad of implications in regards to how it was produced and where that might negate other ways of reducing pollution,” says German. She points to the work of Elliot Coleman, a veteran organic farmer who says you can’t have organic food without soil. Lastly, German says many of us are guilty of failing to acknowledge the ongoing importance of farms. In response to these concerns, IGES Canada says that their offering, along with those of other CEA ventures, are a complement to traditional agriculture. Hanna points out that some 80% of the world’s arable land is currently being used by farming. And with the expected population growth, we need to find solutions to this looming issue. Email the author at george@io9.com and follow him at @dvorsky. 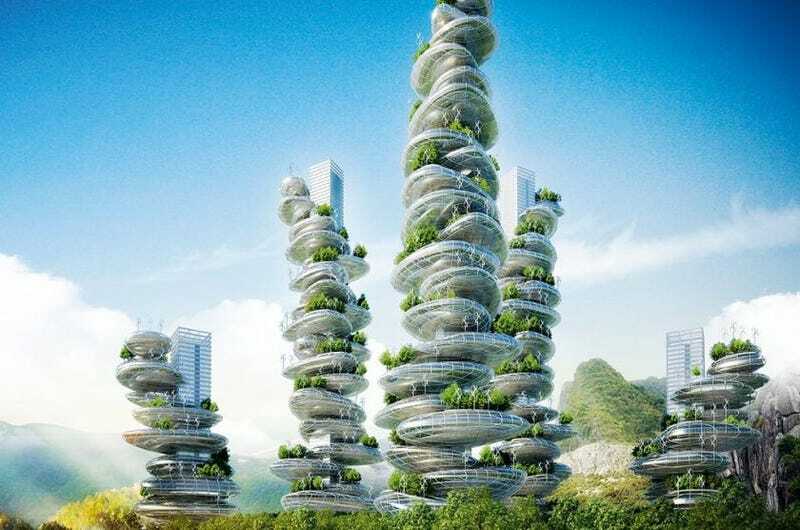 Top image by Vincent Callebaut Architects.